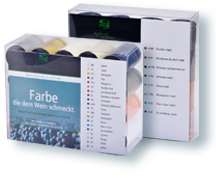 For more security in your decision, which color your goal meets and for a short delivery time, our standard colors are available to you. Our standard colors are the trends that have proved their worth in the market most frequently. Standard colors are quickly retrievable and reproducible. By avoiding residual quantities and deliberate disposal, we pay attention to our goal of conserving resources and protecting our environment. View Our Our Large Selection of Standard Colors Below. You can order any standard color now! Contact us today! Submit your artwork and we will provide you with a free quote.